Magento 2 has an entirely different architecture in comparison to Magento. This blog clearly explains the structure of Magento 2 and also states the difference between the structure of Magento 2 and Magento 1. In the previous article (Magento 2 Widnows Installation/Magento 2 Linux Installation) we were done with Magento 2 installation , now let’s check out architecture of Magento 2. Just like it’s predecessor Magento 1, Magento 2 also follows Configuration based MVC. Besides this, there are lots of new features and libraries are added in Magento 2 like Magento 2 now uses symphony autoloader, introduced jQuery support , etc. 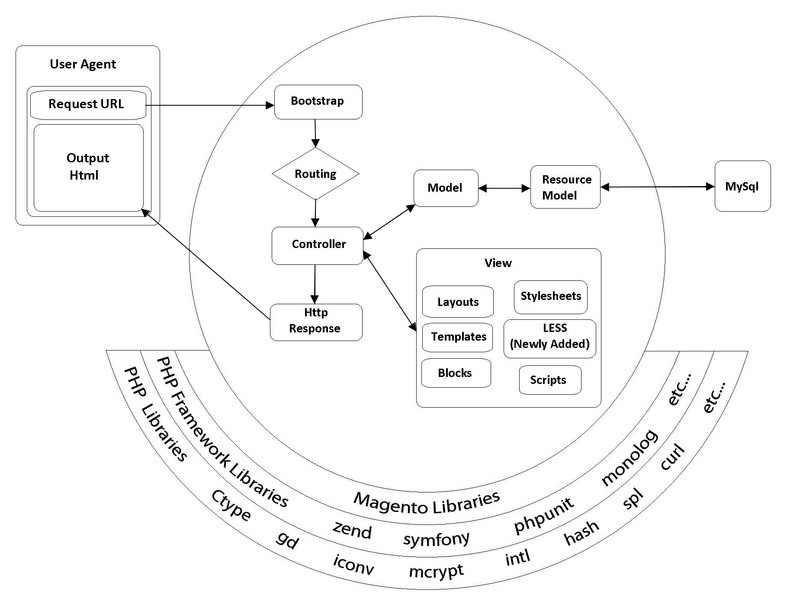 Above image shows current magento 2.0 architecture which hopefully would remain same in future in the upcoming releases of magento 2, Following are some important terms used to describe the elements in the above magento 2 architecture image. User Agent is a software by which user requests magento url. Whenever user enter any url , “User Agent” sends http request to the server for response . As predecessor entry point in magento 2 is also index.php. It includes bootstrap then creates app from bootstrap object and finally calls run function of bootstrap. Bootstrap provides environment for running magento app. It checks php version, sets default error reporting, define base path, initialize and populate autoloader (mapping from a namespace prefix to directories to search in for the corresponding class). Initialize object manager if not initialized till now. Check maintenance mode is on or not if on then show maintenance page. Routing is an algorithm for searching controller by current request. Router decides which controller need to be dispatched. 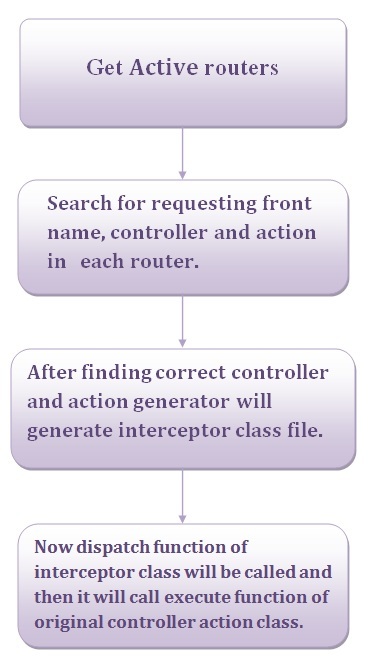 If found controller in router then generator generates its interceptor class and instantiate it. Call dispatch function of instance which will call original controllers action. When controller and action is decided then execute function of action class is called. Here we can use model for business logic implementation. 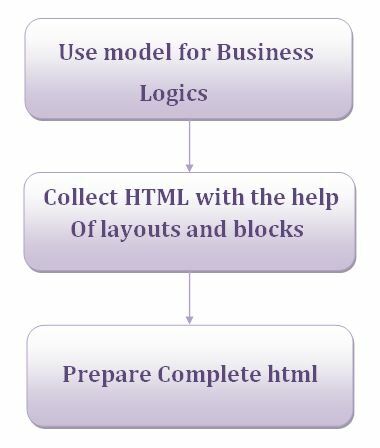 After implementing business logic’s it collects output by help of layouts, templates and blocks. Should you’ve any doubt, you’re most welcome to ask. Thank you so much for this post. It was very useful for understanding Magento’s work flow. Please keep posting. Glad you like the post. We have already posted some useful blog related to Magento2 Theme as well as Magento2 Module Creation which you can easily visit by navigating to other blog section . Your feedback & queries on them would be highly appreciated.